In Kazakh, the bear’s name sounds gentle – Aju. We think of the bear as the owner of taiga and so the concepts of “bear” and “woodless rocky mountains” are somehow not connected. But, nevertheless, in the Aksu-Jabagly Nature Reserve where there is no real wood, bears not only live well but are relatively common. Everybody who visits the zapovednik dreams to see a bear. Actually, there are quite a lot of bears in our mountains. A little less than a hundred bears live in the zapovednik and you can come across footprints of bears everywhere. However, it is hard to see the animal itself! Like any wild animal, it is very cautious and doesn't like to be seen by people. So, the best time to see and take a picture of a bear is in spring. A bear wakes up early from its hibernation and comes out from its den when snow still lies on the mountain. Usually, this happens at the end of March and the beginning of April. After hibernation, these animals need to eat and regain their strength and so they go down to the lower slopes or the South facing hillsides where there is fresh grass which is the basic food of bears in spring time. During this period, you can often meet the owner of the mountain eagerly eating without its usual carefulness. The diurnal activity of the bear in spring lasts until the end of May. Then and in June, you can see bears involved in their mating behavior. During this period, bears collect into groups of several individuals. 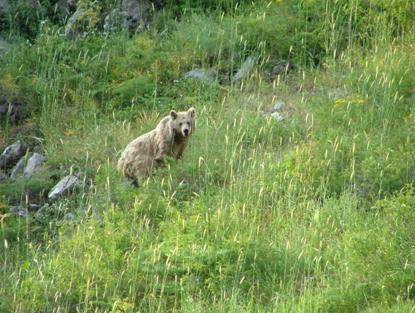 Once, tourists saw nine bears at the same time on the left bank of the Aksu River! In the Summer and Autumn bears are nocturnal. In this season bears inhabit in the Alpine or Subalpine zones where they graze in long grass meadows, wander in open places. During the day, they sleep among rocks or in the brushwood of a juniper tree. The other interesting event in the life of bears happens in autumn, from September to October. Animals put on fat which is necessary for hibernation. Often bears come down to the foothills and visit orchards, market gardens and agricultural crops. Unfortunately, animals raid smallholdings and farms at night but if you are patient, you can see bears in the moonlight, close to villages. Now, one male bear is in the habit of going to a market garden which is just one kilometer from Zhabagly village. To the great distress of the owner of the garden, the bear has eaten almost all of his harvest of tomatoes and carrots, and has started to dig up his potatoes. 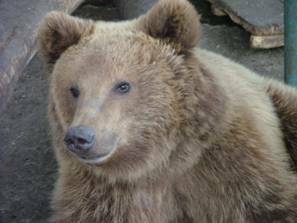 The Tien Shan bear is in the Red Book of Endangered Species for Kazakhstan and it is illegal to harm it. If you would like to see or take a picture of a bear at night, the places it visits have to be found out beforehand by asking local people and examining its spoor. Our bear is a peaceful even timid animal and doesn't attack people. Usually all casual meetings in the mountains come to an end with the flight of the animal, but if you meet a bear, be careful, because it's a bear, not a rabbit! 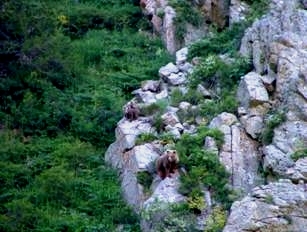 The picturesque figure of the bear is associated with the rocks and mountains of the reserve. Like the ibex and the argali. We can hope that the present listing of this remarkable animal in the Red Data Book is only temporary, and that soon we will meet bears outside the Park also.